Pomper Adventures and Safaris Presents Kikuletwa Hot Springs Moshi Roadtrip. Kikuletwa Adventure is perfect road trip that will enable you get to see the beauty of Kenya and Tanzania with visits to Moshi town and Arusha ‘A’ town. 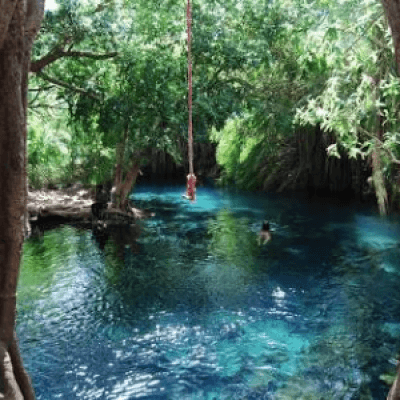 The highlight will be the unscathed Kikuletwa springs that’s an aquatic haven or an oasis surrounded by sprawling fig trees with ropes tied to the branches enabling you to jump into and swim in the warm, clear and fascinating blue waters. Citizens: Kes 7000 kes per person. Depart Nairobi at 6:00 am,have an easy drive to Tarakea border and after immigration formalities and customs proceed to Moshi viewing the panoramic Tanzania and adjusting to the Tanzanian Culture. Check In at the hotel. Swimming in the evening @Hotel swimming pool.Dinner. Party for the willing. Head to Kikuletwa springs an oasis in the middle of this semi-arid landscape. You will see crystal clear water bubbling from underground caves. The water is impeccably revitalizing and perfect for swimming, taking a dip as the fish massage you. Will proceed to Arusha town for shopping and town tour then depart for Nairobi after Lunch via Namanga Border, arriving back late in the evening. Yellow fever vaccination & certificate is done in Major hospitals in Kenya/ Border (kes 1500/=) Vaccine lasts a lifetime if taken from that date. Bookings confirmed by paying kes 3500 to paybill number 763766 account number 0766927281 then forward the mpesa confirmation message to 0716930397.